I sometimes struggle to know what to do when I’m reading my Bible. I want to do more than just read it, but I don’t always have the time or inclination to do a full study either. I wanted a system where I could apply some truths, and have an enjoyable, creative experience. I developed a simple Bible journaling system that works for me, and might just work for you, too. I read some blog posts that I found truly inspiring, and developed a system that I just love. Check out these articles first, and then follow along as I share some of my Bible journal pages and give some tips for your Bible reading time as well. Victoria of Creative Home Keeper wrote an excellent post about the value of writing out Scripture. You can read it here. 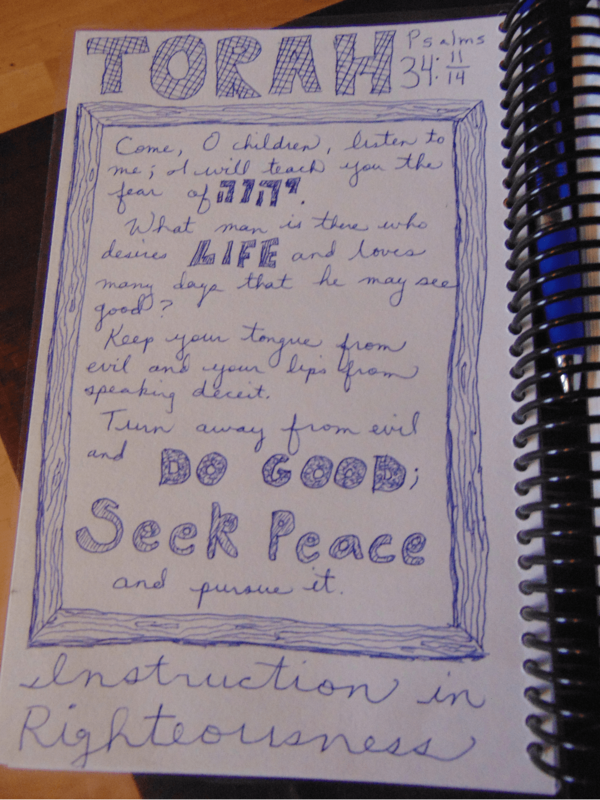 Three Girlies has a great post about creating a faith notebook. Get the info here. I have seen the new Journaling Bibles with wide margins so that you can journal right on the page as you are reading. This sounds great, but I had a few problems with it. I’m not a fan of writing in my Bible, and my husband considers it practically sacrilegious. So, yeah, not really going to happen here. I read passages many times, and they speak to me in different ways each time. I sometimes read on my tablet. I sometimes read in my Bible. I want to be able to write no matter where I’m at or what I’m using to read my Bible. 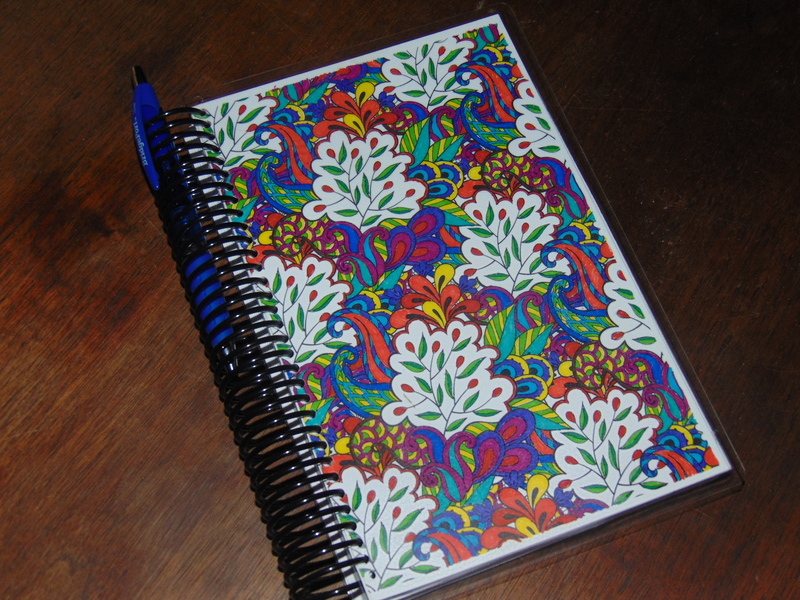 I wanted a separate notebook that I could keep writing in, and I wanted a smaller size, again, so I could use it curled up in a chair or whatever. I looked and looked for printables to make a notebook with, but I just couldn’t find any that suited me. I ended up making a spiral bound notebook. It is basically a half-sized sketchbook with cardstock for pages, and laminated coloring sheets for covers. You could easily pick up a sketchbook and decorate the covers if you desire. Then you are ready to start Bible journaling, and getting more out of your Bible reading time. I use one page and focus on 3-4 verses each time I read Scripture. (I often read more, I just journal 3-4 verses.) I have discovered several ways to use the notebook to illustrate, expound and better understand the passage, and will be showcasing some pages in the weeks to come. Here’s a sample page to give you an idea. Again, I’ll be giving you lots of pics and ideas in future posts. Do you enjoy recording notes and responses as you read your Bible? Tell us about it in the comments! Subscribe to our mailing list to receive post updates and links to great resources for teaching your children Torah.